Since then I have seen other mature plants in Lahore performing like mine. The tree looks so beautiful, but why do you expect a foreign tree to grow and blossom like a native tree? M Farooq wrote: The tree looks so beautiful, but why do you expect a foreign tree to grow and blossom like a native tree? Give this plant another chance for an year and hopefully it ought to perform. Incidentally Adnan Sardar is selling this plant at Rs 3000. I purchased it from him. As some one rightly said that "Opinion of a seller doesn't matter as his job is to sell a plant irrespective of its traits". Same applies here. A business man would never tell you flaws in his products unfortunately. My advise to new comers is to research before trying a new plant instead of relying on seller only. It appears that the plant in picture is regularly pruned the shape of my plant is altogether different. Gardening Interests: By registering to a forum i wish to enhance my gardening abilities. sir, i am no expert in the said category, but as the look of the plant tells me its age roughly 20 years plus). you will have to wait till your fruit of patience ripens. 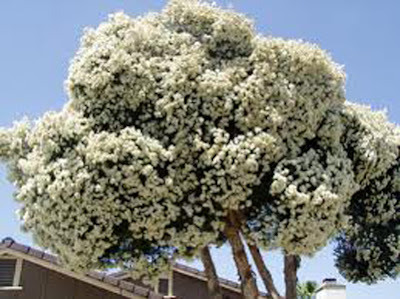 tree seems to be native of Australia and resembles bottle brush family. a visit to Ahmad pur east to sadiqabad, you might find close relative of the plant..